Visitors traveling to Stockholm now have the option of sleeping on a plane! 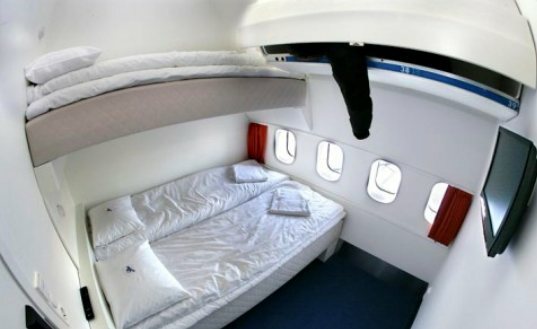 That may not sound like the most exciting proposition until you realize that the 747-200 in which they will be sleeping has been retired from flying, salvaged from being dumped somewhere to rot, and turned into a low-cost, fully-furnished hostel that is perfect for overnight accommodations. 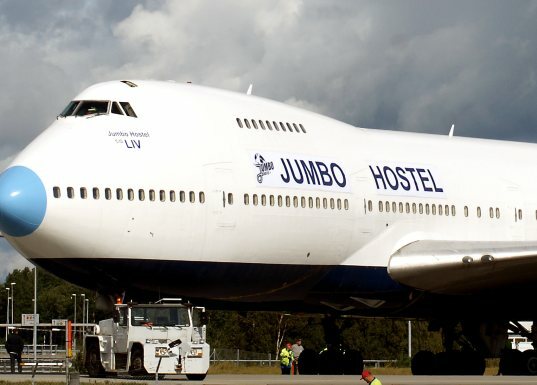 The Jumbo Hostel is housed within a retrofitted 747-200 situated in the Stockholm-Arlanda airport. The jumbo jet has a long history of service – it was originally built for Singapore Airlines and even flew for Pan Am. It was last operated by Transjet, a now bankrupt Swedish airline. The Jumbo Hostel has 25 rooms with three bunk beds each. Each room is around 6 square meters, and naturally, a lucky visitor will get the chance to sleep in the cockpit. Many original parts of the plane still remain – the lounge bar and first class seats are still there, as well as the oxygen masks. New rooms are expected to be built in the engine compartments, where the original rotor blades will be used as venetian blinds. Excellent concept - would love to see an invester create a themed complex of recycled airplanes on a property near an airport where affordable rooms can be had as well as a restaurant & night club.. i've been to a club & restaurant in San Francisco - ( named - DV8 ) on an old airplane... i was very cool. What is an airplane, mostly it's just an aluminum tube with wings, you cut it up and melt it down, who cares. From airplane to soda can and vice verse. a plane which could sleep? i never take on it,now i want have a good night in it!! That sounds pretty cool. Airports should use these types of hostels for passengers that are stranded. Sounds like a good thing for everyone concerned. Did it say how much a night costs? That's a good idea even if it's not new as a concept. I've seen in Costa Rica the use of the parts of an old airplane (a Caravels I think), to decorate and divide a Cabaret. In Lebanon, they accommodated an airplane into a restaurant nightclub. It’s been more than 10 years that they have recycled old airplanes into leisure accommodations: in those countries where recycling is an “science fiction” way of thinking so I think it was time for airport management to do the same (logical!!). Keep on with recycling airplanes for offices, housing and more!!! That's for you to develop, Promotors!!! Love it! we need to recycle everything rather than chucking it away or building new. A great cure for Affluencer! However, if I arrive in a new city the last place I would choose to stay is at the airport...can they move it downtown, now that would be cool!! That's an interesting concept. I like the design of the dining room but I think the bedrooms could use a bit more creativity. In any case it's very original. I think this is a GREAT idea!! Leave it to the Swedes to come up with something so innovative and resourceful! I love the fact that the airplane wasn't just dumped, and I think the "fun-factor" of the experience is high!! As someone else said, hostels aren't hotels and are meant to be fun and cheap. When I was in Sweden in 1977 I stayed on an old docked viking ship and that was very fun. It was a great experience and different form all the other hostels. Same with this one. And it's decorated so cool too!! I LOVE this idea! Just saw a photo of an office building in East Berlin that was 2 old train freight cars stacked up on top of each other (huge windows added of course). I love this idea of re-using what we aren't using anymore and think we need to get smarter about such design instead of tossing things out. Hell yeah I'd stay there. I think every airport should have one or two of these. I would love to stay there! Hostels aren't expected to be big on space..it's really more about the cost and the friendly atmosphere. This looks like a great place to hang out whilst traveling. I don't know how I feel about this. A valiant effort at recycling but I don't know how practical / cool this experience would really be?! Just a thought ... Would you want to stay here? irplane hotel, green refurbishment of an airplane, reclaimed waste hotel" /> The Jumbo Hostel is housed within a retrofitted 747-200 situated in the Stockholm-Arlanda airport. The jumbo jet has a long history of service - it was originally built for Singapore Airlines and even flew for Pan Am. It was last operated by Transjet, a now bankrupt Swedish airline. The Jumbo Hostel has 25 rooms with three bunk beds each. Each room is around 6 square meters, and naturally, a lucky visitor will get the chance to sleep in the cockpit. Many original parts of the plane still remain - the lounge bar and first class seats are still there, as well as the oxygen masks. New rooms are expected to be built in the engine compartments, where the original rotor blades will be used as venetian blinds. It is not often that one gets to stretch his or her legs out comfortably in an airplane, and while this isn't quite like flying in first class, it does the trick and is an ingenious way to save a plane from being sent to landfill. The hostel is now open to visitors.